Even if you may not be a lover of transit, I do like to issue this occasional reminder: generally speaking taking transit results in fewer greenhouse gas emissions than if you chose to drive alone to wherever you’re going. That’s a nice benefit, not to mention that taking transit is a cheap way of getting around. 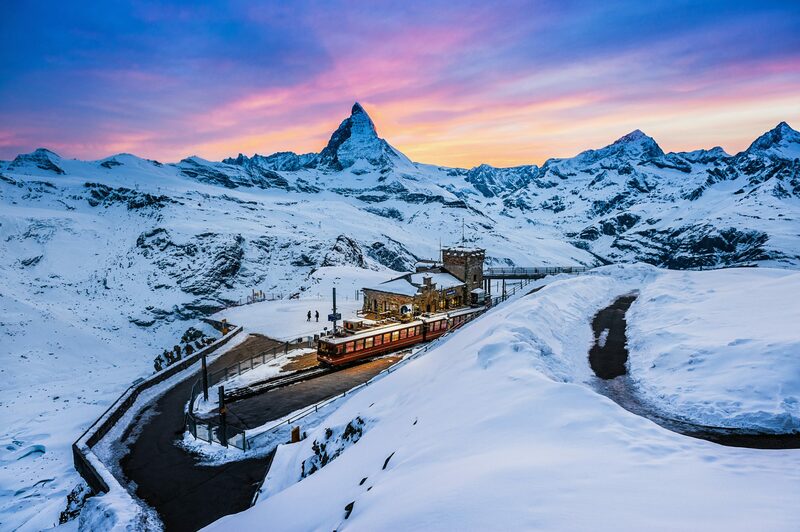 Beautiful twilight view of Speaking of Earth Day, the Matterhorn at Gornergrat bahn, Switzerland. Credit: Getty Images. Pretty interesting Smarter Cars podcast that covers a lot of ground, including self-driving cars and Metro’s efforts to bring its own on-demand services to our county. Probably the most interesting local transpo story of the last couple weeks. On Wednesday, the L.A. City Council’s Public Works Committee approved an environmental study exemption for the Boring Company (owned by Musk) to build a 2.7-mile test tunnel between a private lot near the Expo Line in West L.A. running south to Culver City. The issue now goes to the full Council, which often follows the lead of committees. One concern, [USC’s Marlon Boarnet] said, is whether the test tunnel — and the eventual transportation network that Musk envisions across the county — could interfere with the Metropolitan Transportation Authority’s plans to build a subway through the Sepulveda Pass. To address those concerns, the public works committee recommended Wednesday that the Boring Co. seek approval from Metro before digging can start. Here’s the letter from Metro, in which Phil Washington also requests a meeting with the Boring Co. to discuss the respective projects. Metro’s Sepulveda Transit Corridor project is in the midst of a feasibility study to evaluate rail alternatives with potential connections to the Orange Line, Van Nuys to Sylmar/San Fernando Metrolink Station BRT or light rail project, the Purple Line Extension, the Expo Line and other connections near LAX. Local funding for the project comes from Measures R and M. Metro is also pursuing the possibility of a public-private partnership to deliver the project sooner. What we don’t know is much about the overall cost of the Boring Company’s tunnel network, whether the firm has the money in hand to build it and how much it would cost to ride. The Boring Co. is privately funded; their FAQ says no public money is needed. Company spokespeople said Wednesday that a full environmental review would be done before any passenger service would begin. There are two main layers to this story. There’s the public versus private effort to build an underground transit system — and the merits of both projects. And there are questions about environmental law and when rigorous studies should be required (here’s a Streetsblog LA post about that). I know that enviro studies can be long and frustrating, but in the case of Metro they also give the public a say in shaping projects and mitigations. Lots of interesting stuff. Related: on the subject of the Sepulveda Transit Corridor, there’s a new survey posted for those who travel in the 405 corridor. The L.A. City Council recently approved going forward with the $4.9-billion dollar automated people mover that will connect the LAX passenger terminals to a new transit station serving the Crenshaw/LAX Line, the Green Line and numerous bus routes. And thus the headlining question Meghan McCarty Carino: are there people who will actually use the train-people mover connector to get to the airport? The signs are, however, that most people won’t use rail to access the airport in the foreseeable future. They’ll rely on cars and bus shuttles like FlyAway operated by Los Angeles World Airports, as they’re doing now. Los Angeles County Metropolitan Transportation Authority planners project the share of people using rail to get to and from LAX by 2035 will be relatively small – between 1,500 and 3,000 rides a day. That amounts to just around 1 percent of the projected total trips taken to and from the airport. These projections were made in 2014 before final plans for the Crenshaw Line and the automated people mover were in place and before passage of Measure M, a sales tax increase that will dramatically expand transit in the county. But Metro planner David Mieger said the predictions are in line with what Metro is expecting on the Green and Crenshaw Lines by 2035. My three cents: I don’t think the percentage breakdown of the way people get to LAX will radically change, but I think it’s smart to build the rail-people mover and that people will use it because it will be cheap, relatively quick from some rail stations and be more appealing as the Metro system expands. It’s easy to overlook that LAX supports about 50,000 jobs in the airport area, just as it’s easy to forget that the Green Line will one day be extended south to Torrance and east to the Norwalk Metrolink station and the Crenshaw/LAX Line north to a potential connection to the Red Line. The Sepulveda Transit Corridor, as mentioned above, is looking at rail options between the San Fernando Valley and LAX. These are all Measure M projects. As Meghan makes clear in her article, getting from DTLA to LAX will require three transfers: from the Expo Line (to be renamed because the Regional Connector connects the Blue, Expo and Gold Lines) to Crenshaw/LAX Line to the people mover whereas the LAX Flyaway bus runs directly from Union Station to the terminals. I’m guessing some DTLA folks will opt for Uber/Lyft, others from airport shuttles, others the scheduled FlyAway service from Union Station and others from the six DTLA light rail stations and still others from friends/relatives who don’t mind driving to LAX. To me, that’s a good thing. Have as many options as possible at as many price points. As a consumer, that’s what I want. Whenever I take the bus to LAX, their bus center seems practically deserted. I’ve often thought that it could be better promoted by the 5 agencies using it (including Metro), bothas cheap and easy transit to the airport as well as a potential transfer point. If the planned 96th/Aviation station’s bus hub effectively becomes a replacement, perhaps it would induce a bit more demand. Your paragaph “The signs are, however, that most people won’t use rail to access the airport in the foreseeable future. They’ll rely on cars and bus shuttles like FlyAway operated by Los Angeles World Airports, as they’re doing now.” says it all. For those interest, see the KPPC article at https://www.scpr.org/news/2018/04/17/82290/how-many-angelenos-will-use-multibillion-dollar-tr/ and my comments. This will all depend on how close their homes are to Metro stations and how many are traveling. The Tokyo airport express is a separate rail line to the airport. Many still take buses or private cars to Narita International Airport. Since Metro costs $1.75, this should be the selling point even if it might add more time to the commute. The end result might be even with private car since the horseshoe is most disastrous. I think single or business travelers can benefit more from Metro and People Mover than families going on vacation. I might have an option to have family or friends drop me off at a Metro station instead of parking at the airport. Won’t the people mover connect to a new central parking lot as well? That means the rental car market will use the people mover to get there. So, there’ll be no need for all those parking shuttle buses (or the G Line and LAX City Bus Center ones), freeing up a lot of curb space for drop-off passengers. Since LAX World Airports is paying for it, it should be regarded as making the airport easier for all sorts of users (passengers and employees), irrespective of whether they use Metro rail to complete their journey. If it were to collect to a long-term parking lot as well, it would be even more useful. As Martin alluded to here, the offloading from the LAX horseshoe to the people-mover connected transportation center of the many hotel and car rental shuttles will be the greatest benefit of this project, reducing or eliminating most of the congestion at LAX. I personally don’t think most people will use our light rail system, if only because of its lack of luggage-handling capability, but even if travelling by car, being able to avoid that last half-mile will be a godsend. With the need of three transfers in order to get to LAX from downtown one would think the MTA would solve that problem but no, reliable public transit is not a priority to them. Once the public becomes aware of the new 96th street tranist station and the convenience of dropping off and picking up family and friends outside of the loop the people mover will be packed with travellers. My understanding is that the Aviation/96 station is designed primarily as a transit hub. A separate stop on the people-mover, near the long-term parking lot, is designed to allow passenger drop-off and pick-up by private car. At least this is the way it was when the initial design went out, it may have changed since. I have actually used this facility long before it was built 🙂 I sometimes drop off family on my way to work near LAX, and if I’m in a hurry but they have time before their flight, I will drop them off at the cell-phone waiting lot near Parking Lot C where they can catch the C shuttle to the terminal. The people mover will make this easier and more common — though I suspect most people will still drive to the terminal. A defect in the article is its title. Just as important is the number of non-Angelenos who will use the system. People coming in the the area don’t have a car available, and are more likely to go to Metro-served destinations. If they come from Europe or Asia, they are likely to be regular train users and will naturally look for one. And you say that BART at SFO doesn’t serve the terminals directly. The one it does serve directly is the International terminal – I’m tempted to say that they got something right! And you omit a crucial piece of data on Heathrow Express – it makes a profit. A big one – $99m in 2016. 1,500 to 3,000 passengers per day doesn’t justify the project. However there will be thousands more passengers who use the people mover to get to rental cars and drop off from friends at the intermodal center. What are the people mover ridership forecasts including all of these travel markets? Also, how will passenger pick-ups be managed with the people mover? The majority of congestion in the horseshoe is from family, friends and ride share cars circling and waiting for their passengers to arrive. Will the people mover cause a lot of these pick-ups to move from the horseshoe to the intermodal center, thus moving the traffic congestion from the horseshoe to the arterial streets? I’ve looked for the environmental documents to help answer these questions, but they aren’t available on the LAWA web site any more. If Musks tunnels can skip a review process why can’t metro projects do the same? The City Council action would give The Boring Co. an exemption from environmental review for the proof-of-concept tunnel. If the project advances beyond that, they would almost certainly have to do a full-blown study.